Long known for the pistols of modern IPSC matches, STI has come out with a new IDPA legal and for those of us that prefer for IPSC use the Trojan. A truly unique take on the single stack 1911. This is a standard 5″ 1911 or a 6” version is available in calibers from 9mm to 45Super, there should be one to fit your personal needs. Starting from the ground up this is a fine version of the infamous 1911. It incorporates a number of custom shop type features; dovetailed front sight, Bo-Mar type rear sight, extended safety, speed bump grip safety, fitted barrel and bushing, etc. all for under $1000. Not a bad deal considering what you get in this pistol. One of the unique features of the Trojan is the front strap texturing. 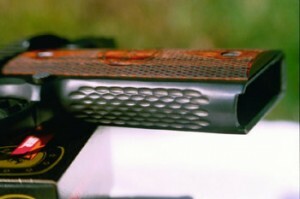 Instead of checkering or stippling the front strap has a tree bark type texture to it. 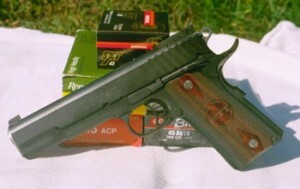 Not only does it look cool, but it works and affords a good purchase to the firearm. Overall impressions of the Trojan were good. The pistol shot everything that was run through it from the best in defensive loads from CorBon, Winchseter, CCI, Triton to handloads using 200gr LSWCs, JHPs in weight from 185grs-230grs, and of course 230gr round nose, both lead and FMJ. It fed these from magazines from Wilson, Brown, McCormick, and had no hiccups. Accuracy was more than acceptable with 8 shots groups off hand at 20 yards averaging under 3″ for all rounds fired. The Trojan I shot had a particular like for Federal 185gr Hi-Shoks and kept that group of 8 rounds under 1.75″ for match grade type accuracy.